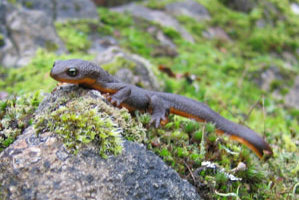 The Rought-Skinned newt is found in British Columbia and on Vancouver Island on Canada’s West Coast. These newts are quite big with a long tail and some Rought-Skinned newt can grow up to 17cm. They are Black or dark Brown with a yellow to reddish orange abdomen. Another factor that help identification is that they have darker lower eyelids and long limb. The males have longer legs and tail and the vents look swollen compared the Rough-Skinned newts females. The rought-skinned newt skin has a rough touch due to glands that contains poison : tetrodotoxin. The toxic effects of this West Coast newt is generally experienced only after ingestion, although there are reported case that some individuals experience skin irritation after touching them. Beside pollution and humans, they are the prey of the common garter snake that have a high resistance to rought-skinned newt toxin. Rought-skinned newt are often be seen during the day near swamps or permanent pond near forest where to can be found under rock or logs in the forest cover. Adult specimen tends to be highly aquatic from the breeding season to the end of summer. They feed on preys like worms, aquatic invertebrates, larveas, tadpoles and insects..